Parquet Courts unveil "Black and White" ahead of the release of upcoming LP, Sunbathing Animal. 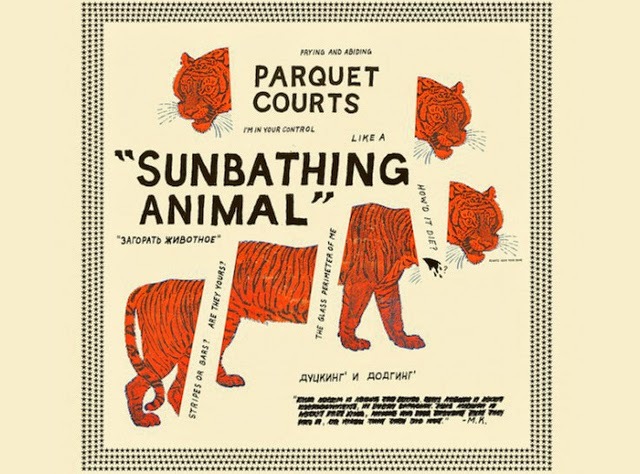 Inching onto a slightly lighter, less aggressive scale, Parquet Courts' "Black And Blue" is the perfect counter balance for their previous and title track from Sunbathing Animal. Don't get us wrong, this is in no way a light track - this is Parquet Courts we're talking about - but it does sound a bit more at ease with the world, even with its typically jagged guitars skills and random sci-fi fx. It's becomes more and more clear with every track that Parquet could be the band to fill that huge gaping KOL void. Parquet Courts' Sunbathing Animal is set for release on June 3rd through What’s Your Rupture?/Mom+Pop - grab a pre-order here.